They look authentic and ever so yummy! Thanks, Angie. Wish I had one right now! Hi Jean, this looks a wonderful recipe. I have made the traditional round shape more often than not, but a couple of times the wedges. I am going to make yours just as you describe. Thanks for the share, always looks wonderful in your photos. These look so delicious.. I love how you make your own buttermilk. I always do as well! Admire your china.. I have a partial set of these... love the teapot!!! Denise, thank you. Let me know how they turn out for you. Thanks, Schotzy. Those dishes were a gift from dear friends. I love them (the friends and the dishes!). I used to really hate scones but as i've got older they're actually ridiculously yummy!! 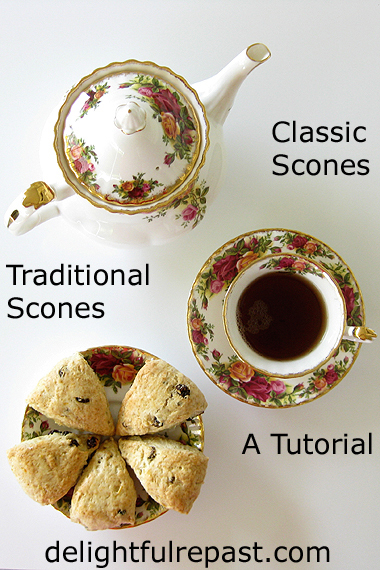 What a wonderful series of photos for your tutorial and I am imagining many trying your great scones. Thank you so much for walking us through instructions. Lovely dishes too! Thank you, Bernideen. It was such fun for me! Of course, *you* don't need any help with scones! Ah Jean, scones. To get the full effect I would need to hear how you say, scone, to ascertain your ,"class." Are you posh or are you a mere common person? If you say scone with a rounded elongated O sound you are aristocratic. If you say scone with a flatter more guttural shorter sound you are working class. Nowadays if you use use the rounded full O sound people would look at you and think,"she's putting on the airs and graces. "Everybody uses the flatter guttural sound. I like a good scone with butter and jam on it. Good one Jean. Thanks, Tony. I wanted to include info about pronunciation, but the post was getting sooooooo long, something had to give! Everybody in the US, posh or common, pronounces it to rhyme with stone. When I've pronounced it to rhyme more with gone (probably picked up from my Northern--Lake District--grandmother) people have thought, "she's putting on the airs and graces." I'd love a scone, Jean, and yours look perfectly wonderful! I like scones of all shapes, and even love drop scones. My very favorite scone that I ever had was from Cabra Castle in Ireland. Thank you for sharing your recipe, and also the peach berry crumble cake that I missed last week. Happy baking! That's the way to say it Jean, as with , gone. Saying it as in, stone, is very plummy and posh. If we were ever to meet Jean, you might be surprised at my accent. It's a southern accent. I do not, however, have clipped vowels like some posh southerners. My accent comes from a particular place in the south. Even though I have lived in London for over forty years people can still tell I come from Southampton. It has a mild, soft burr to it. Just remembered, I did once have a scone with chocolate chips but did not care for it. Rather have a plain scone and save the chocolate for croissants or cookies. Thanks, Kitty. Perhaps I'll get to try a scone at Cabra Castle someday! Tony, I love that you don't have to go far in England to hear a different accent. You have to go many miles, sometimes several states away, in the US to find one. Hi Jean!I would love to have tea with scooones with you!Thanks for the tutorial.Gorgeous china!Hugs! Quinn, I quite agree with you--I don't want chocolate chips in my scones and I love dried cherries. 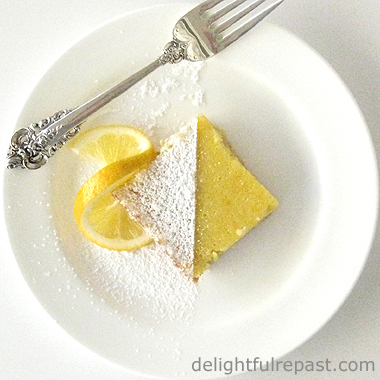 I often make this recipe with chopped dried cherries instead of the currants and orange zest. Thank you, Maristela! And I hope you'll tell us sometime how many different china patterns you have in your collection. Jean, these scones look beautiful. Pinning. I hope to try them very soon. I've only made them twice, and mound was the shape. I need to try that wedge. Thanks so much for sharing your knowledge. Lea Ann, thanks so much. I love the wedges. Let me know how they turn out for you. My dear Jean, your scones look positively wonderful! You have inspired me to make some very soon. Stephanie, thank you so much. Funny, I was just thinking about you yesterday and planning to visit your blog this weekend! Thank you for posting this at beginner level, Jean. 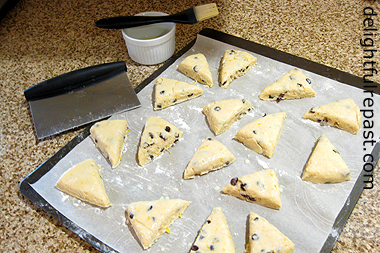 I think you know I generally prefer round scones but I think I'll try the wedge version to avoid the dangers in over-handling the dough after cutting the first circles. Thanks, Jean. I'm bookmarking this one for when I'm home and have all my baking equipment. THey look delicious and your instructions, as always, are impeccable. Thanks. I have so wanted to know more about scones. Thank you for this tutorial. Yours look wonderfully delicious! Pauline, thank you. And do let me know how you like the wedges! Jeanie, thank you. I hope you'll like them. And do let me know if I've left out anything in the instructions. Chip, thank you. I hope you'll try them soon with a nice cup of tea! Hello Jean! Your scones look lovely! I make my scones both ways; round and wedges. Just depends on my mood, I guess. I almost always drizzle glaze over the scones or sprinkle on a little sugar. Hubby prefers the glaze whereas I prefer them without. I like serving fruit scones at Christmastime. Seems that time of year, I use fruit in everything; cookies, fruitcake, puddings, etc. This time of year for whatever reason, I like plain with jam and whipped cream or clotted cream. They really are a treat with tea or coffee. Enjoy your weekend. Sandi, thank you! I do like a plain scone as well--especially with a little jam and a lot of cream! Thanks, Kirsty! And do let me know how they turn out for you! I'm always happy to read and think about scones, largely because I've had so many happy times eating them. A scone (or two) for elevenses is an excellent choice although scones for afternoon tea suits me even better. Of course, the major controversy in the UK (at least in Devon and Cornwall) is do you add the jam or the cream to the scone first. The Cornish way is jam first but cream first (clotted, naturally) is favoured in Devon. I prefer jam first and, I'm led to believe, so does Her Majesty the Queen and there's no arguing with that. Funnily enough we've been making mini scones today with some added dried seaweed to serve alongside cocktails. Phil, I'm afraid I'm with Devon on this issue. I like to put on a generous amount of clotted cream, then top that with just a little jam or curd. Your savoury cocktail scones sound delightful! I hate to admit this but I've never made scones nor have I tasted them. I know!! Just think of all I've missed. You make it appear so easy!! I do love my tea, I think I'll have to make some soon. What flavor would you suggest for my first time? Marisa, before you venture out into the *fresh* fruit scones, master *this* recipe. 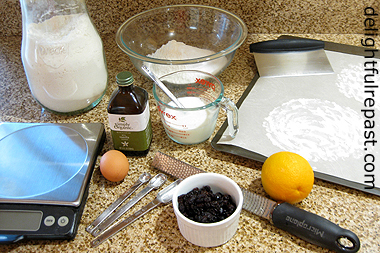 The dried fruit, citrus zest and vanilla extract are optional; you can use any or all of them or go strictly plain. Make the same recipe repeatedly in order to get it down, then branch out. Lisa, then you need to make my Gluten-Free Scones--everybody raves about them. I made them for a big tea party, and even the non-GF guests were gobbling them up and asking for the recipe! I'll eat scones of any shape! I like both plain and fruit scones, but also enjoy savoury scones like bacon and chives. Last week, one of the bakeries was selling bacon and chocolate chip (!) scones. I'll try anything once. HA! Margie, I almost never make savoury scones, but when I do, it's bacon and cheese and herbs. I don't like chocolate chip scones--with our without bacon! 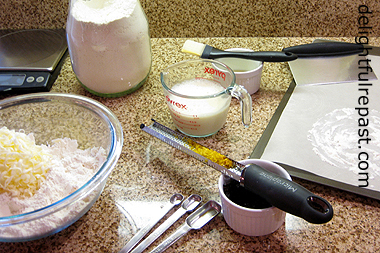 I LOVE scones and have made them from scratch several times from multiple recipes. Even though I know they are supposed to be drier or barely mixed, mine are always just crumbly so that I cannot get a round anything. Might it be the altitude here in Denver? Cheryl, you will need more liquid at that altitude. And this recipe with an egg will work much better for you than those recipes without egg. Follow this recipe exactly, and in step 3 add more milk just a tablespoon at a time. Let me know how it goes; we'll make this work for you! I was never a fan of scones until I made your classic scones! I always thought of them as dry. 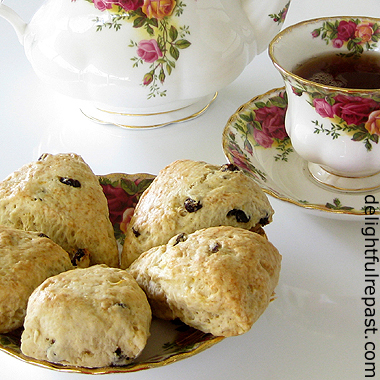 Your classic scone recipe is on my favorites list. Now that you brought it up I just might make a batch! Thanks, Jean! Sue, that's quite an endorsement! Thanks so much. And, yes, do make a batch today! I always thought it would be very 'tricky' to get them right. Karen, thanks so much. I hope you'll try the scones soon and let me know how they turned out for you. Classic is good! Thanks for the tutorial. Who doesn’t love a good score? Even Mrs. Mummy Harris has come around! I suppose recipes for scones are like recipes for chicken soup… there are many out there, and so many are good! I look forward to trying yours… With clotted cream and strawberry (always) jam. You've reminded me, David, I need to get down to business and put up a batch of strawberry jam! My jam cupboard is bare--down to a single jar of marmalade. Hope you try these soon! We love making scones in the weekends. I'll have to try your recipe. Thanks for linking up with me this week. Thank you, Puddles! With round scones, the ones made with rerolled scraps of dough are never as good as the ones from the first cutting. Do try these! Julie, thank you. And do let me know how they turn out for you. Thanks, Tarah. I always enjoy the party! You have presented these scones in such a beautiful way! Love the addition to dried fruit. Thank you, Laura! Wish I had one right now with my cup of tea! 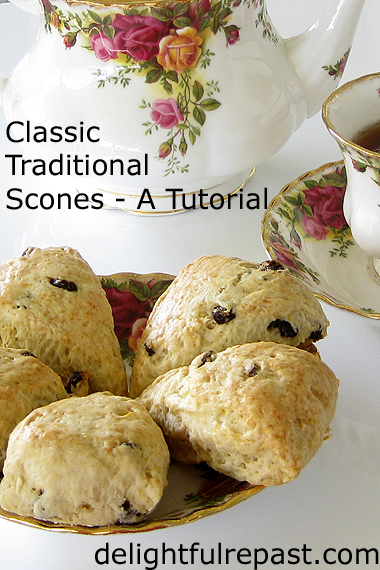 Your tutorial for scones looks awesome, I just love scones! Hope you are having a wonderful week and thanks so much for posting with Full Plate Thursday! Thanks so much, Miz Helen. See you Thursday with something cool! Amazing! I didn't know there was so much technique in making scones. I have never made them before but have always enjoyed the scones and cream combination offered in cafes. Americans pronounce 'scones' with a long 'o' sound, while Ozzies and British pronounce it with a short vowel sound (as in 'scahns').... funny! Thanks, Fran! I hope you'll try these. I used to say 'scahns' (probably picked up from my English gran) but so many people here (US) "corrected" me that I gave up and went over to the long O! Great post! I've had scones, often, but have never made them. Wonderful tutorial. I'm all for the wedge shape -- easier, and no waste, as you say. I always cut my biscuits into squares rather than rounds for the same reason! Thanks, John. I make square biscuits, too! Great minds and all that, I guess! Lucy, a good scone *makes* an afternoon tea for me--I don't need any of the little sweet treats, just scones and sandwiches and lots of tea! I always enjoy scones, but I never thought to make them! These seem really doable. Thanks for the recipe! Yes, Connie, definitely doable! I hope you'll try them soon and let me know how they turned out for you. I have saved this posting for weeks knowing I would one day get to reading it, and I'm finally here! Thank you for this fabulous tutorial! 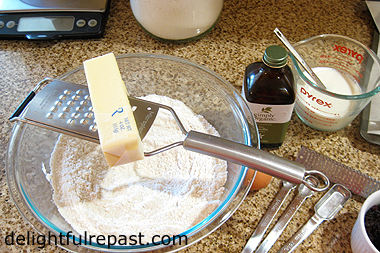 I especially liked the idea of grating the butter, I will remember that for other recipes, great tip! Thank you, Debbie! You just made my day! I'm so glad you found a helpful tip. Is it possible to make the scone and refrigerate PRIOR to baking so they'll be piping hot when served? I'm planning a afternoon tea party shower for 15 women and I'd like to make it easier on me. Michele, it's very late right now, but I will answer your question tomorrow! Michele, do a little experimenting before the shower. The problem with refrigerating the unbaked scones prior to baking is that after a certain amount of time the baking powder might lose some of its oomph. 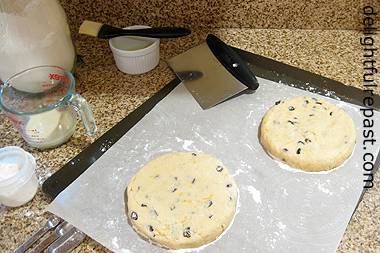 you can freeze scones baked or unbaked. To reheat frozen baked scones, thaw the scones wrapped. Preheat oven to 300F/150C/Gas2. Reheat, loosely wrapped in foil, for about 10 minutes. To bake frozen unbaked scones, no need to thaw. 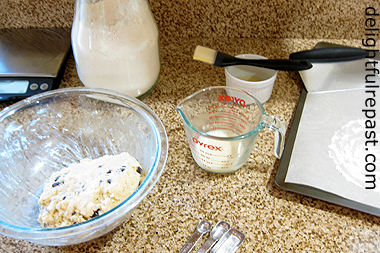 Remove desired number of unbaked scones from freezer and place them on parchment-lined baking sheet to warm up a bit while the oven is preheating. Follow the preheating and baking instructions in my recipe. You'll probably need to add 2 or 3 minutes to the baking time.